This month Julie Warther shares with us one way art was used as an introduction to haiku. I recently had an encounter where art was used to introduce students to haiku with great success. I would like to say it was my idea as a haiku poet, but it was actually initiated by a children’s librarian and carried out by high school art teachers. Last year, our local library installed a StoryWalk around the pond at our city park. Essentially, a StoryWalk consists of sixteen permanent signposts along an outdoor path. Each post features a two-page spread of a children’s picture book, inviting walkers to a read-as-you-go experience. In our case, one lap around the pond and you’ve read a whole book. The signposts are designed so they can be opened and allow the material inside to be interchanged. In this way, visitors to the path enjoy a new book every month. Our children’s librarian, Dani Gustavich, asked if I would provide some of my haiku to be displayed in the posts for National Poetry Month. I selected sixteen spring haiku and planned to print them out in a large font to fill the display cases. But even with a snappy font and colorful paper, the sparse poems didn’t look like they would draw the attention of readers used to viewing picture book pages in these displays. So Dani sent the poems to the high school art teachers who initiated a small art contest among four of their classes, including courses in painting, digital photography and mixed media. The teachers led a short discussion of haiku and passed out copies of the sixteen poems. As a class, they brainstormed the mood of each poem and what visual imagery might be appropriate to convey the feeling of the selection. Students who wished to participate could choose any of the poems to illustrate. The art teachers would then select one piece of art for each poem and the winning artwork would be displayed with the poems on the StoryWalk. After about a week and a half, nearly ninety works were submitted. The results were thoughtful portrayals. It was obvious the students took some time with the poems. 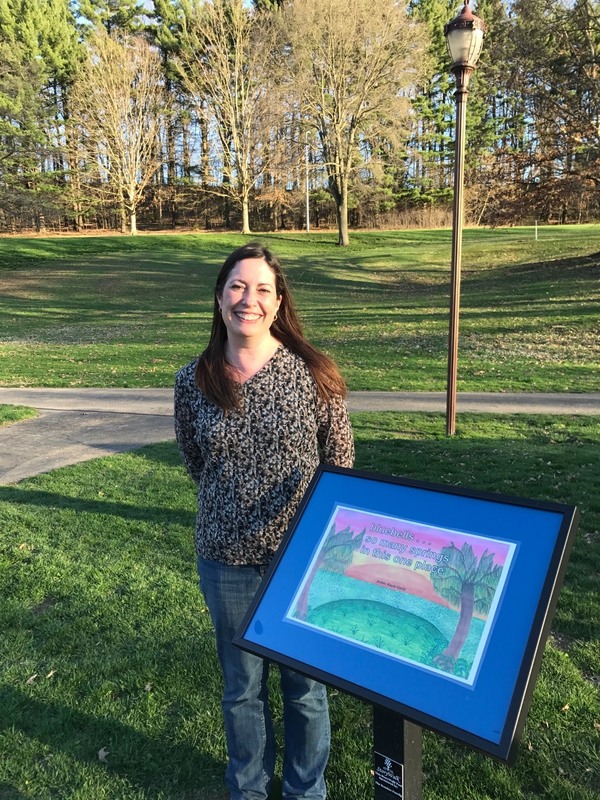 An artists’ reception was held at the park so the public could meet the students and view their work. You could see the pride as they stood by their respective posts. There was also excitement as I met each artist for the first time and they met the previously faceless writer of the words. I don’t think any of us: not Dani, the art teachers, the students or I, understood at the time what we were doing, but we all seemed to recognize at the reception that something very special had transpired. Students had been introduced to haiku in a very gentle way; as a means of prompting their own creative work. 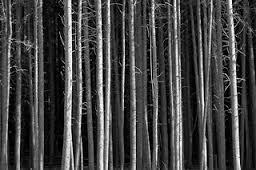 In the process, it had been necessary to interact with the words on more than a surface level. And when the words were digitally placed into their artwork, the synergy that emerges from collaboration became apparent. 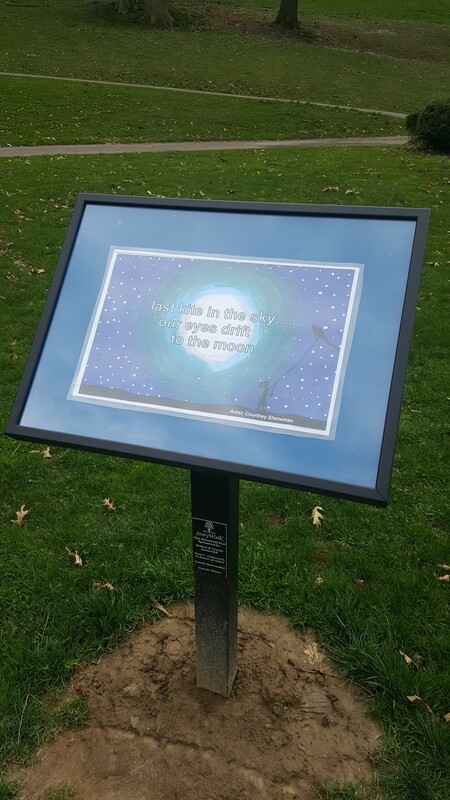 So there was a learning experience in the creation of the artwork, but also for all who viewed the haiku and illustrations while visiting the StoryWalk during National Poetry Month. 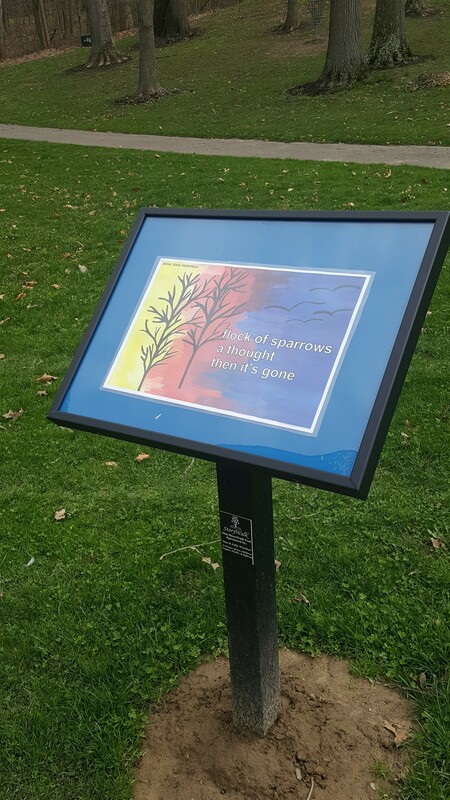 The artwork was engaging and drew the public to the poems. Art students who participated but did not have work selected also reported visiting the StoryWalk to view the display. The art teachers felt this experience helped raise the students’ awareness and appreciation of public art. Of course, not every community has a StoryWalk. But the means of display is only one part of this experience. The introduction to haiku, the creation of the artwork, and the collaborative nature of the project are key elements. 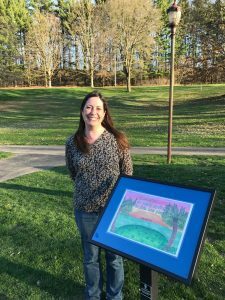 The pieces could be displayed on a school bulletin board, at a local art center, on a wall at the library or in the windows of local businesses. It was truly a serendipitous teaching experience. If I had planned it, I probably would have tried too hard to instruct rather than allowing the students to discover the essence of the poems themselves. In the future, if I wanted to move on to a discussion of haiga and how it differs from illustration, I believe I would still start with this exercise and ease gently forward. I’m thankful to Dani Gustavich of The Dover Public Library for her vision and initiative and the Dover High School Art Department for making room in their curriculum for this project. And especially for the students who brought color and a bit of themselves to my poems. Love this! A great way to introduce haiku and to make connections with other departments in the school! Thank you for sharing how it unfolded! Thank you, Mary! Yes, building connections and including the arts across the curriculum can only enhance learning. Thanks, Ellen! Yes, isn’t it something! This collaboration was a little different as there was no communication between the students and me, only between the art and words! Interesting the way it worked out. How exciting to view these three images in the  story book path–the project is most interesting starting with the haiku–thinking about the mood, what the words say–obviously the students really liked doing this. Thank you for sharing this unique experience. This is so inspirational, collaborative, formative and beautiful–the essence of haiku. Thanks, Jo! Yes, the students were really engaged and felt some ownership of this project. So glad to hear about how you and your colleagues designed an experience where haiku were starting points instead of “the” point. If the students like em, they’ll want to learn more! Wonderful project, it must have been truly rewarding, and even if it’s unknown, there will be some great positive results from this in years to come as well. Thanks, Alan. Agreed! As with any teaching experience, we often don’t know how far the reach might extend. And so, we keep putting out the word and hoping for the domino effect!